Design Challenge: This very small slopping urban site needed privacy for quiet relaxation and entertaining. It lacked interesting focal points. Soil sloughed down slopping beds onto the lowest level. The fences were bare wood and white vinyl without softening vines, and the plantings seemed chaotic. The area lacked warmth and interest. 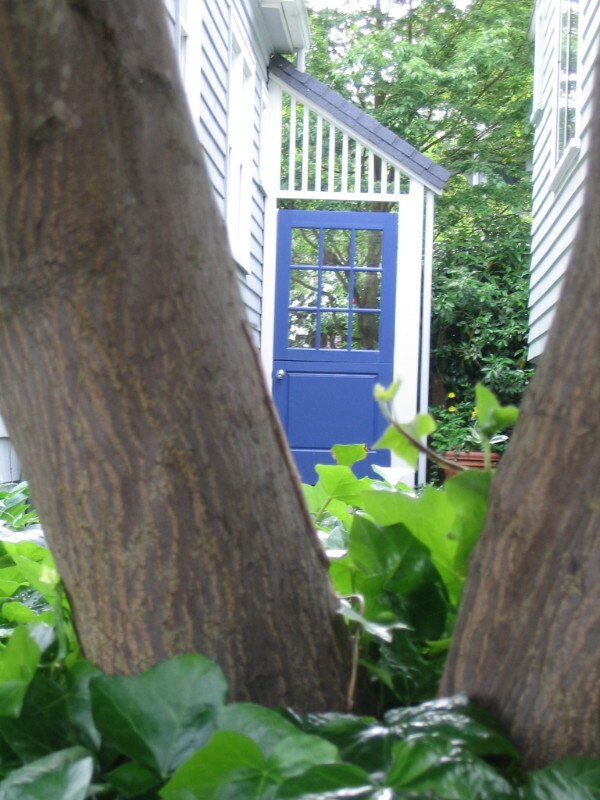 Now: The blue garden door hints at the secret urban surprise ahead. Several paths and stepped terraces gracefully absorb the original 8' slope. 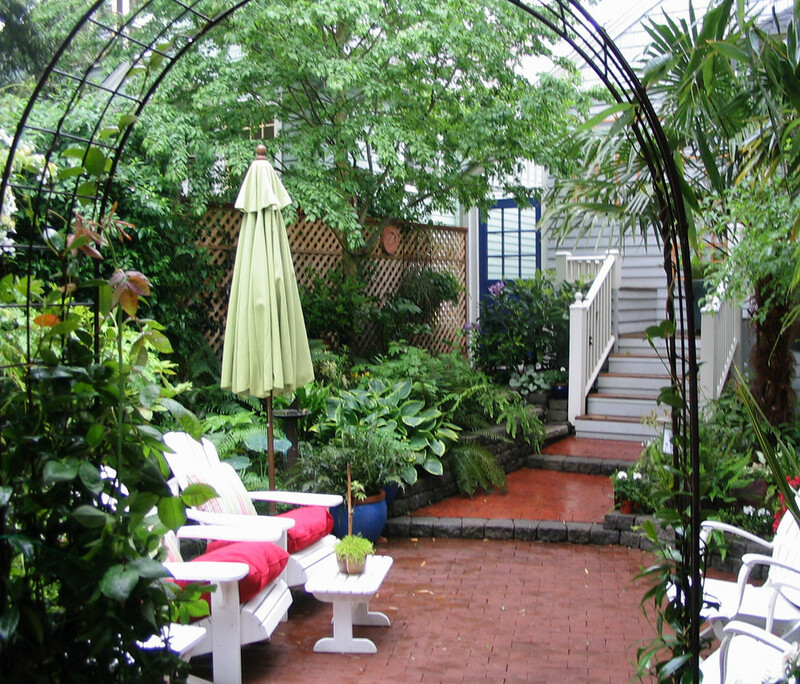 Outdoor rooms and paths encourage walking and enjoying plants and the visiting animals at the birdbaths and feeders. A variety of humorous, affordable art pieces are tucked throughout the garden waiting to be discovered. Bright color is splashed through the many green textured plants. 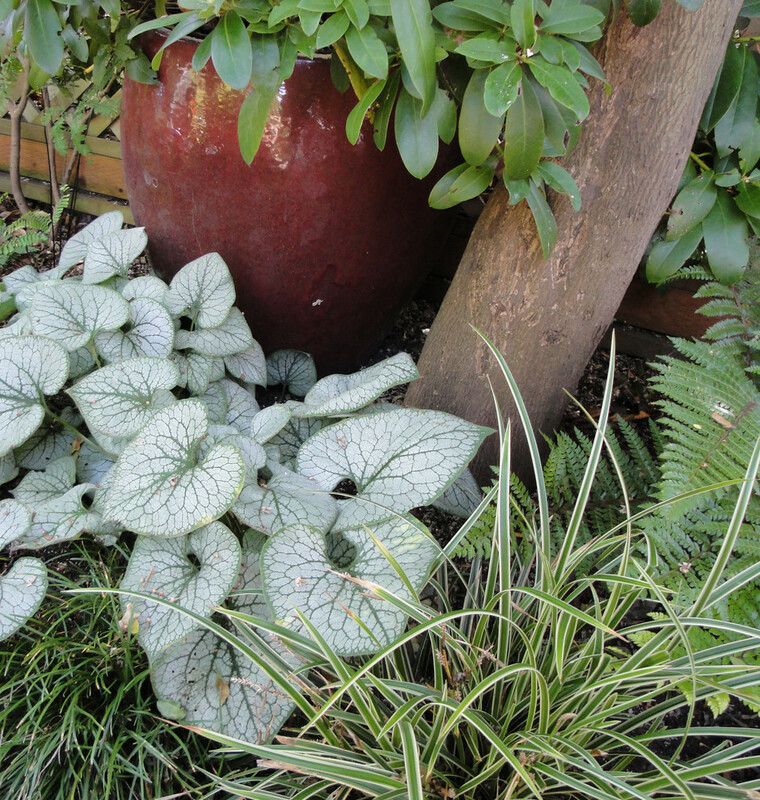 Large-leaved dramatic plants mix with finely textured ones. 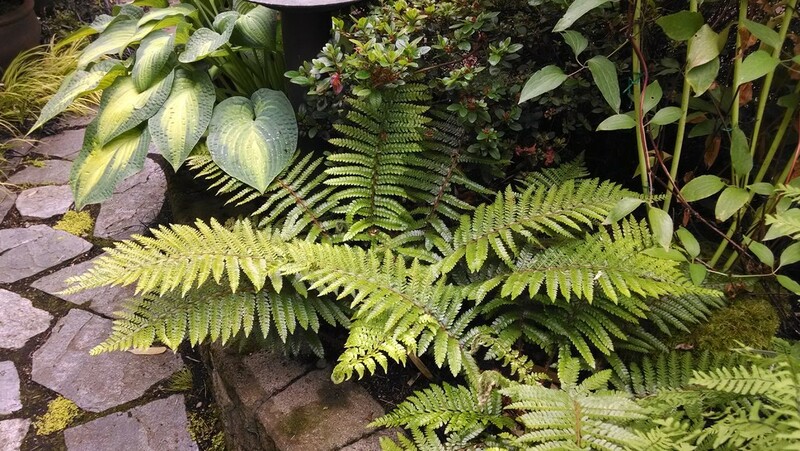 The many evergreen plants and the colorful garden art are interesting even in winter. 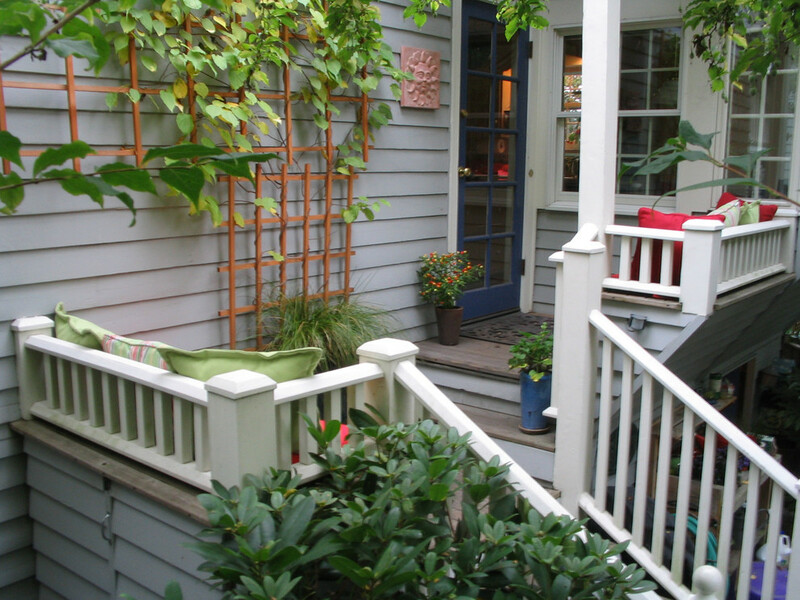 The connection between the kitchen and garden was enhanced by redesigning the back stairs and adding hidden utility storage and additional seating over it. Garden storage was carved out of unused space under the house. The lighted pavilion seats six, is visually private, and is wired for music and lights. A small tiered fountain muffles the ever-present urban noise. Furniture was chosen to be comfortable and easy-care. One long fence is covered with house siding which adds to the seamless flow between house and garden. 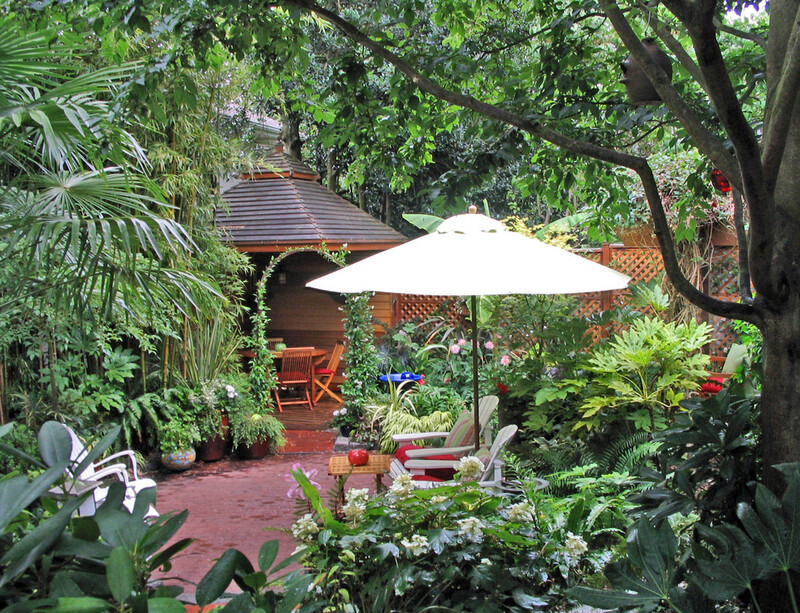 This sunken terrace is one of 5 outdoor rooms in this compact urban garden. It is surrounded by lush plantings. The pavillion is unique because the roof is cantilevered eliminating the need of a fourth post at the entry. The terrace is the hub of the garden with brick and stone paths connecting it to the other rooms. The stairs and low retaining walls/steps connect the sunken terrace to the house. The bench at the top of the stairs has lids that lift up to access the garbage and recycle cans. On the back of the bench are large doors so the cans can be taken out and moved to the curb on collection day. To create a 'room' feel a door was used in lieu of a gate. The door locks from the inside and can be opened from the outside with a key. The path leads to a landing with stairs up to the house or down to the sunken terrace. The fencing matches the house adding to the unity. Climbing hydrangeas are beginning to cover the garden walls. 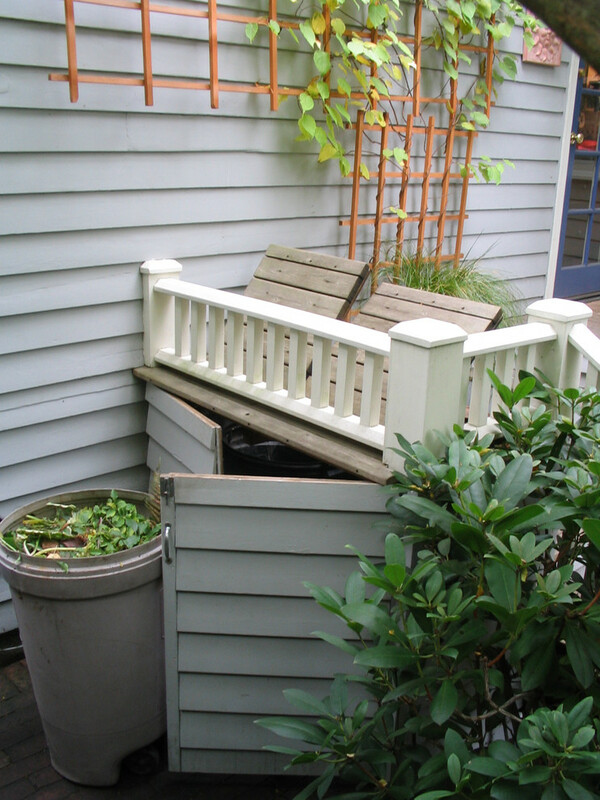 The downspout was diverted away from the house through the faux roof over the garden dutch door. The water goes into a drywell. 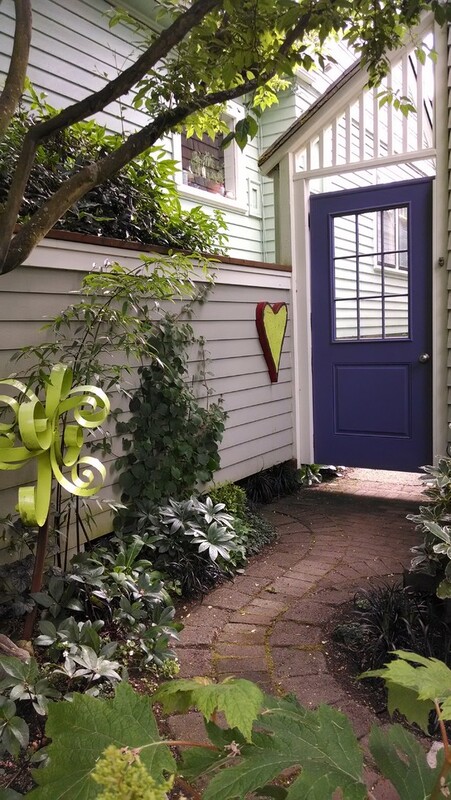 Purple color pops all the doors to this gray home. 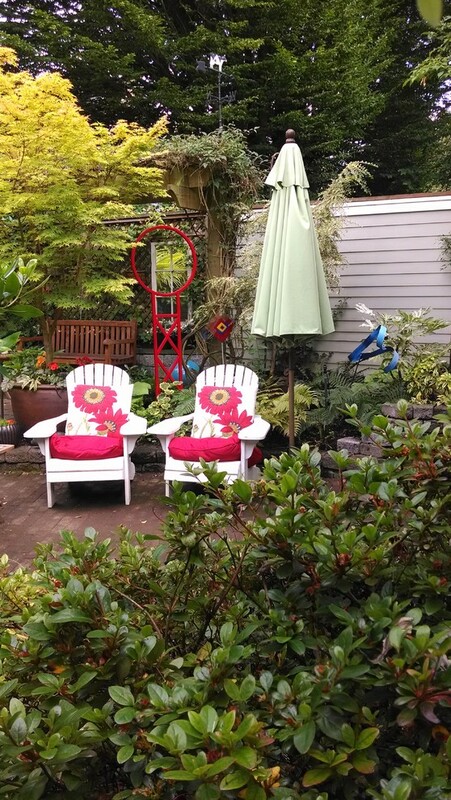 Lush planting choices create privacy from close neighbors. Garden art provides year round color. Red and lime are repeated throughout the landscape in plants, pots, and fabrics. The metal art piece was from Home and Garden Art, Seattle. The maple tree is in a large pot and clematis covering the trellis varies the heights in the space. Male kiwi vine on a trellis softens a large blank wall. Benches provide additional seating for garden parties. Stairs lead to garden and walk to front of house. View out from eating nook looks over the garden. Brightly leaved plants liven up a shady garden. 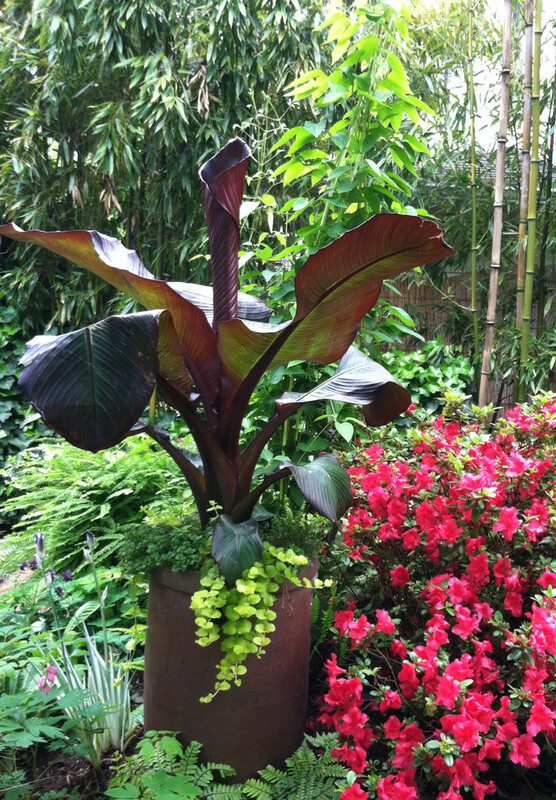 Tall, colorful containers add interest and vary plant heights throughout the garden. 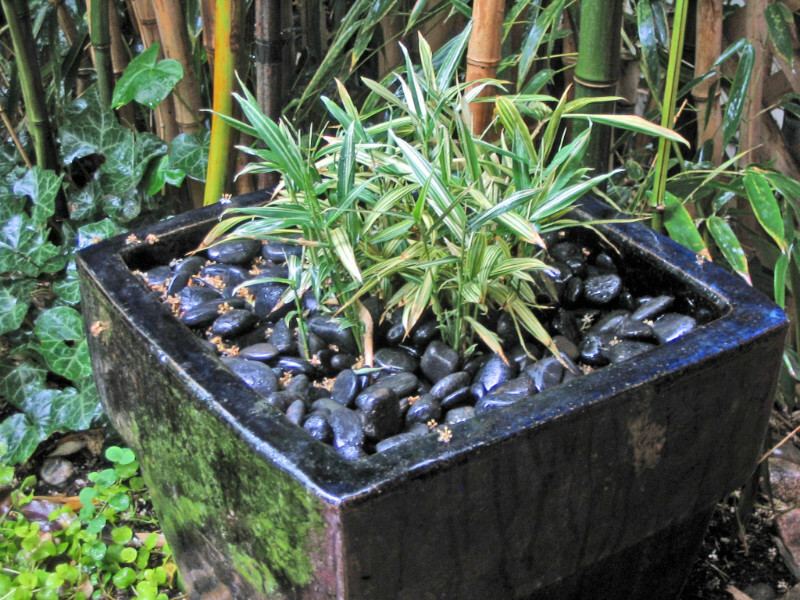 A black shiny pot with polished Mexican Rock and dwarf bamboo adds interest to the full hedge bamboo background..
Fatsia 'Spider' and the yellow-edged daphne play nicely together with the red metal curl adding a contrasting color pop. A great winter combination, too. The fence siding matches the house. Many hydrangea vines are beginning to cover the fencing to green up the 'walls' of the garden. 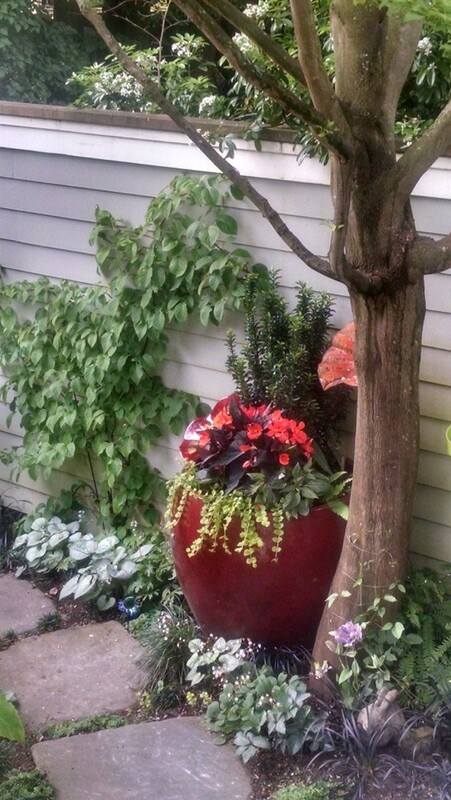 The large red container allows planting close to the tree roots and adds colorful interest to the area. 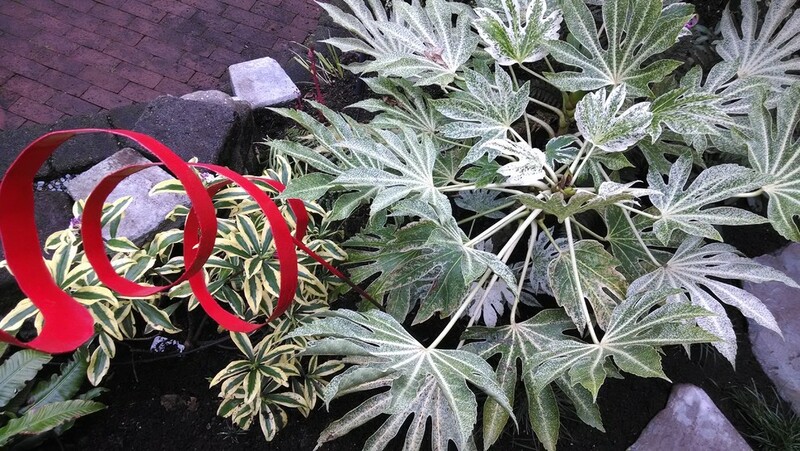 The glass 'flowers' are still bright in the winter.The glass and begonia colors echo each other. 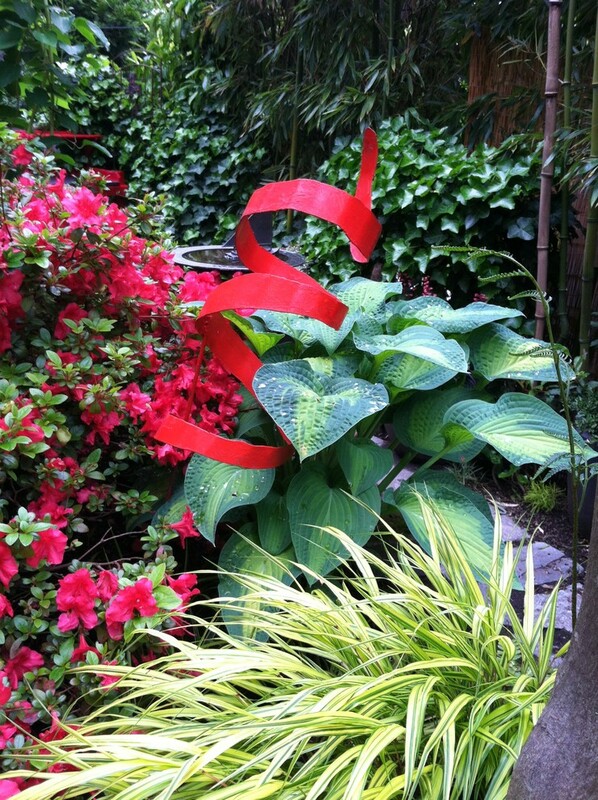 Textural combination of small leafed azalea, two-toned large hostas, narrow yellow Japanese forest grass, and the red curly metal art piece make the garden interesting. Textural leaf combinations make for interesting viewing. Chartreuse makes most gardens sing!